The 80's and 90's were the best time to grow up. Technology wasn't nearly as advanced as it is now so there was no reliance on it like there is today, kids played outside most of the time, and films came on thick plastic boxes called VHS. Collecting VHS was the thing that I found myself in when my parents bought me my first VCR in the early 90's. One of the things that I remember the most was going to the video store and seeing VHS trailers play on the TVs that were scattered throughout the store. They would mostly be shortened versions of the film's theatrical trailer and would highlight when the film was coming out. 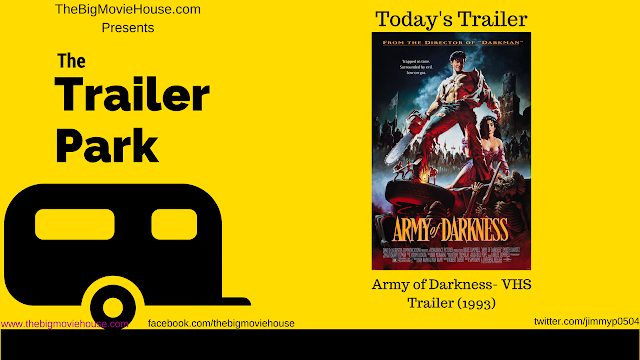 This Army of Darkness VHS trailer was one that I remember the most. I saw the film in the theater and loved it. I anxiously awaited for the film to hit the video market and would see this trailer in my local mom and pop shop all the time.